Camden Allen William Jones, 3 of Auburn passed away Sunday, June 24, 2018. He was born March 31, 2015 in Springfield, the son of Kyle and Jennifer Casson Baker Jones. Camden was a firecracker and all boy. He loved his daddy and mommy, cars, trucks, train, mud and bugs. 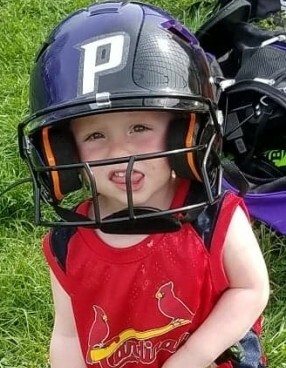 He enjoyed watching his sister play softball. Surviving are his parents, three sisters, Rebekah (15 yrs), Emmalyann (11 yrs) and Kylie (6 yrs); several grandparents, aunts, uncles and cousins. Visitation will be Wednesday, July 11, 2018 from 4 p.m. till time of services at 6 p.m. at Bramley Funeral Home in Auburn. Memorials may be made to the Camden Jones Fund at any CEFCU location.